It seems that a practice I’ve adopted in my life is visiting San Francisco once a year. Different reasons have brought me to the Bay Area during different seasons each year. Last November my annual trip to the Left Coast was sparked by a childhood friend’s wedding. The timing worked out such that I had just quit my job in NYC and hadn’t yet started at my current one, so a few extra days for dining with The Bro seemed like the right thing to do. 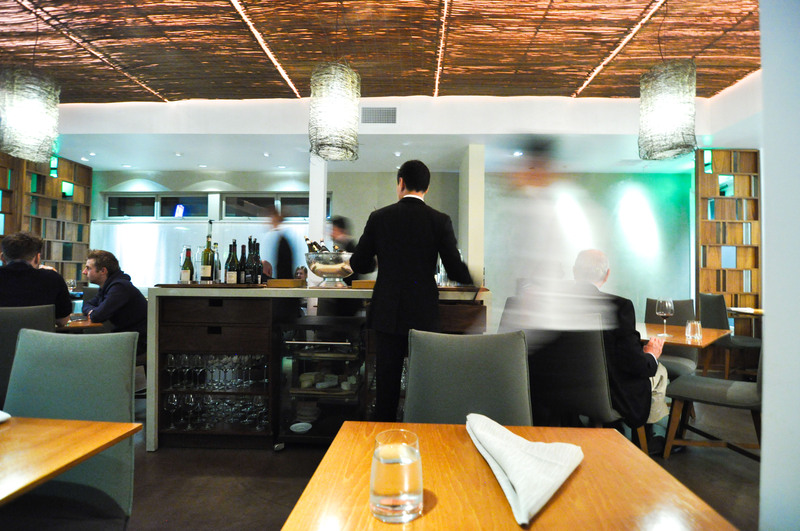 My first evening in town landed me at my most anticipated table of the trip: Dominique Crenn’s Atelier Crenn. Nature rejoice, chasing childhood memories. A subtle smokiness has arrived, and a new start. Birth which gives its morning mystery. Autumn whispers the untold memories. A Kir Breton to begin. 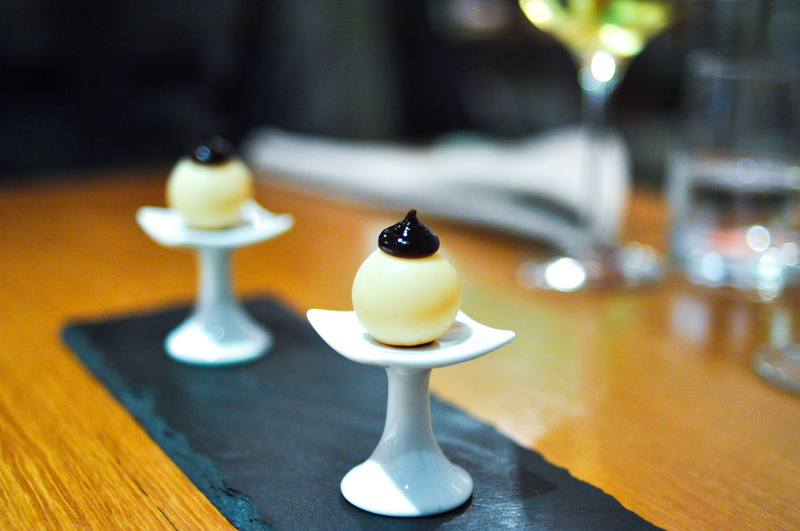 Inside a delicate white chocolate shell, pressed apple cider. Topped with a reduction of creme de cassis. Following the burst of the shell came a flavor that at once took my mind to the Kirs I’ve been served at Brittany-style creperies in France. Mellow serenades of colors of red and green. 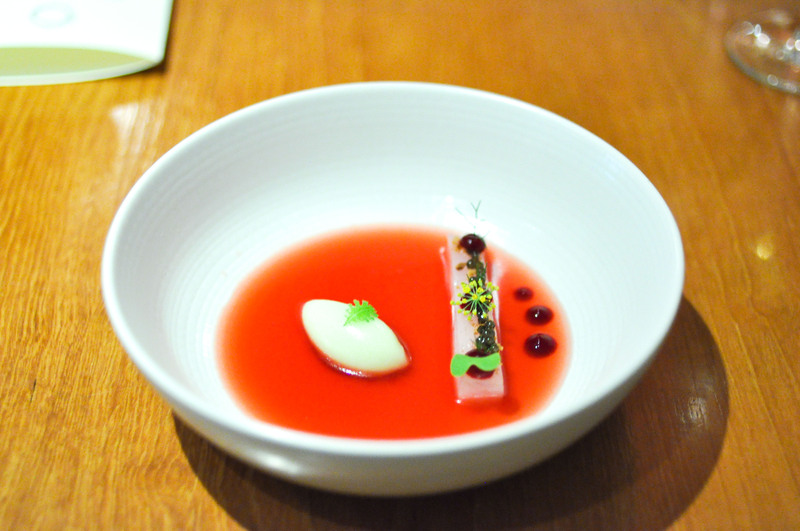 Hamachi with Osetra, fennel, apple and celery sorbet, beet puree, and lardo, finished with a wonderfully savory broth of crustacean shells and beets. 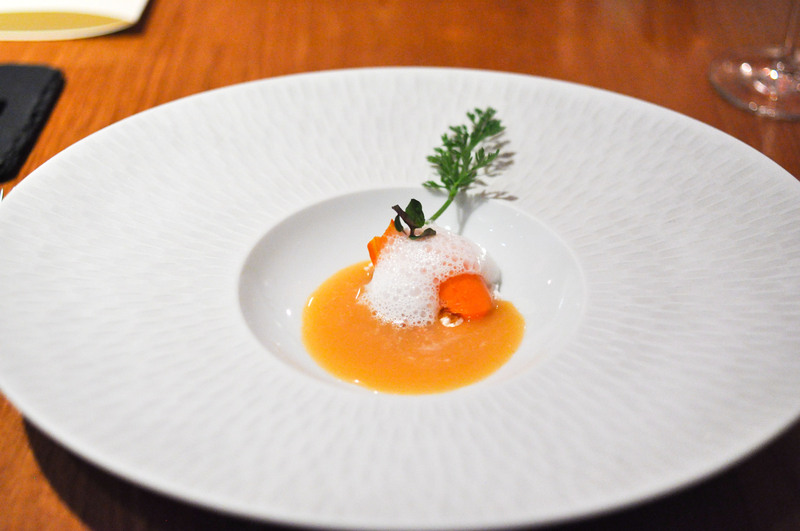 The sorbet melted into a bright, lively acidity that heightened the fresh fish and balanced the broth. Bites of fennel lent a cool finish. The glowing ocean and light écume de mer. 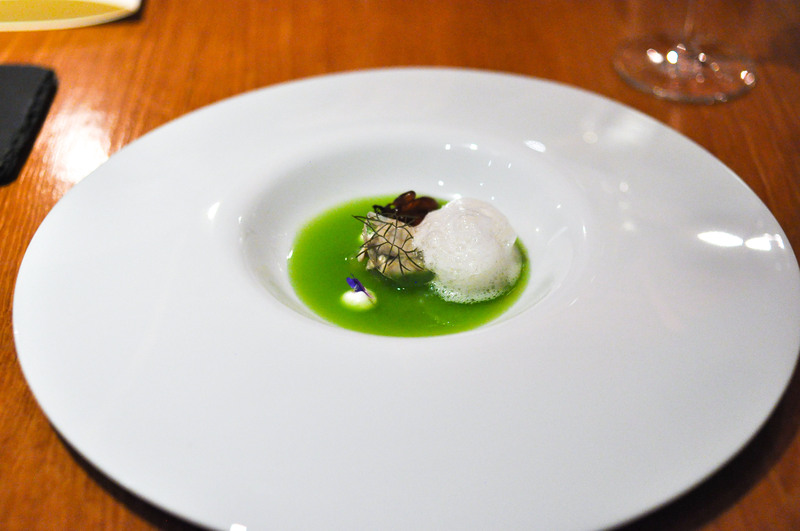 Washington Kumamoto Oyster with creme fraiche, compressed cucumber, elderflower sake gelee, sea grape, and wheat grass. 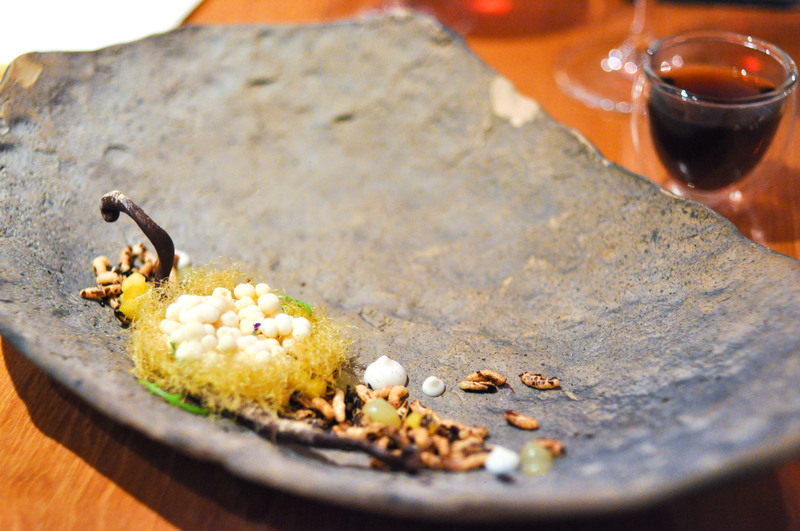 The astringency of the wheat grass was compelling against the sweet, mildly briny oyster. 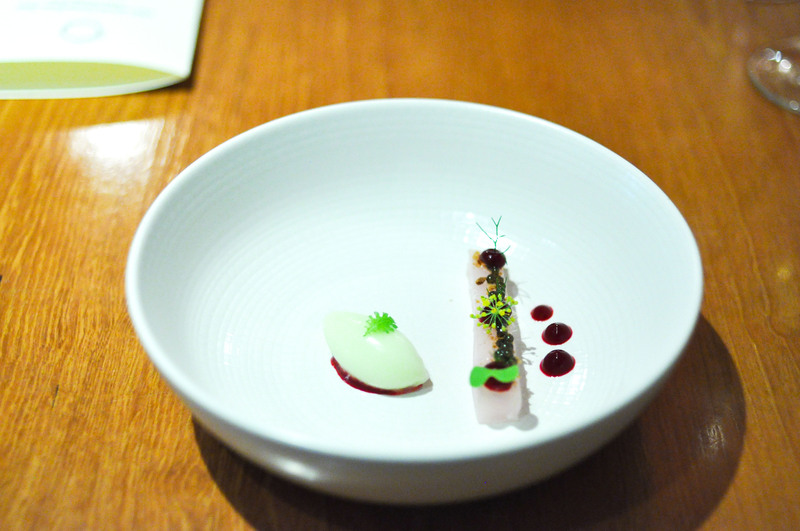 The fresh cucumber flavor with the sweet and floral gelee made an excellent setting. Wherein a moon burns orangey bright. 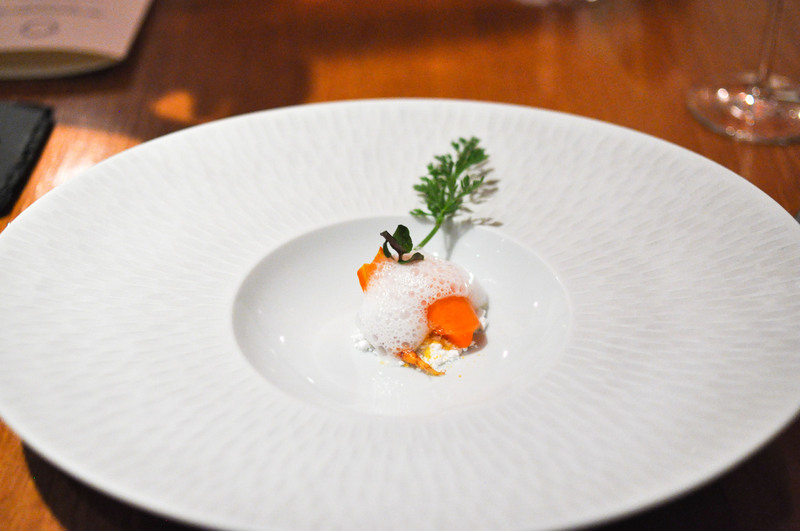 Carrot sorbet, dehydrated carrot, and baby carrot with coconut powder and coconut foam, aloe vera gelee, and rutabaga and grapefruit tea to finish. I enjoyed the texture of the coconut powder with the sorbet as well as their different sweetness levels, which balanced well with the bitter tea. Nature rejoice, chasing childhood memories. 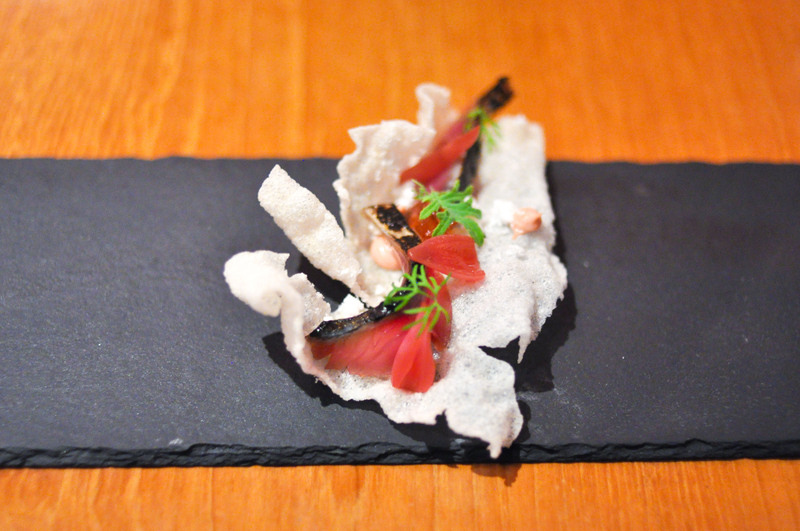 Ginger cured Mackerel atop a jasmine rice cracker with onion marmalade, plum and smoked lardo emulsion, and wasabi leaf. A superb celebration of the fish. 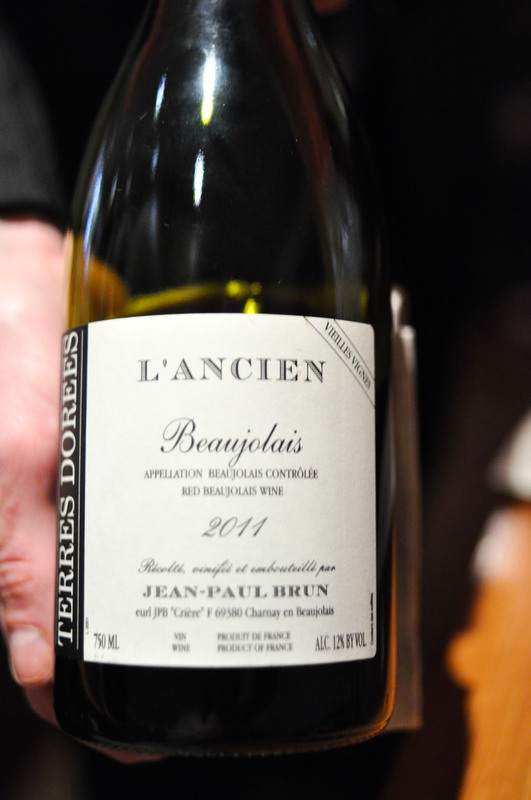 Sweet and salty notes surprise and supplement the feature. As the breeze caresses. 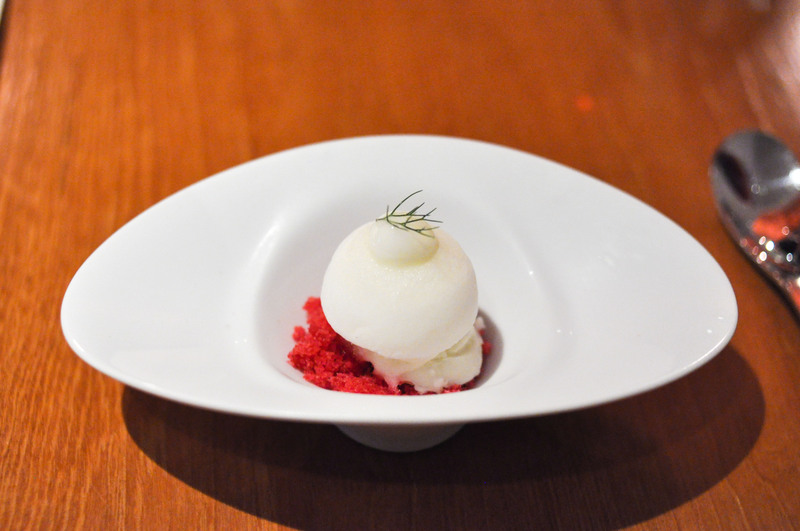 Hibiscus granita, meyer lemon sorbet, frozen fennel mousse. Tartness from the meyer lemon and cool herbaceousness from the fennel brought together by the sweet, floral hibiscus. A gentle smell, oceanic, of yummy feeling. 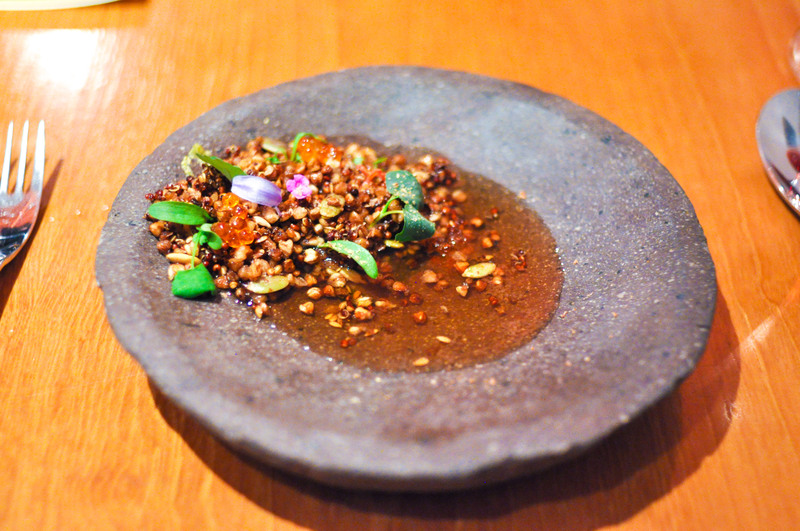 Buckwheat and quinoa grains with pumpkin, sunflower, and flax seeds, house made bottarga, dashi, and yuzu kosho. Perfect snap/crunch to the grains. 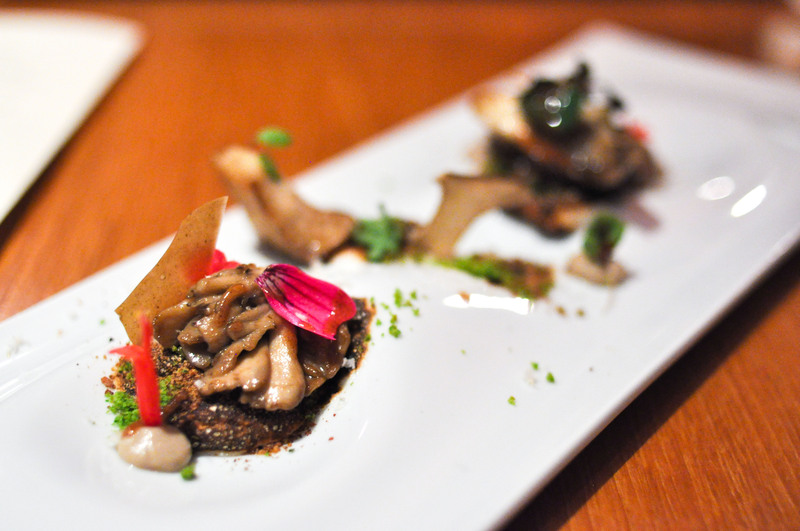 The yuzu kosho provided some sporadic pop-up spice. 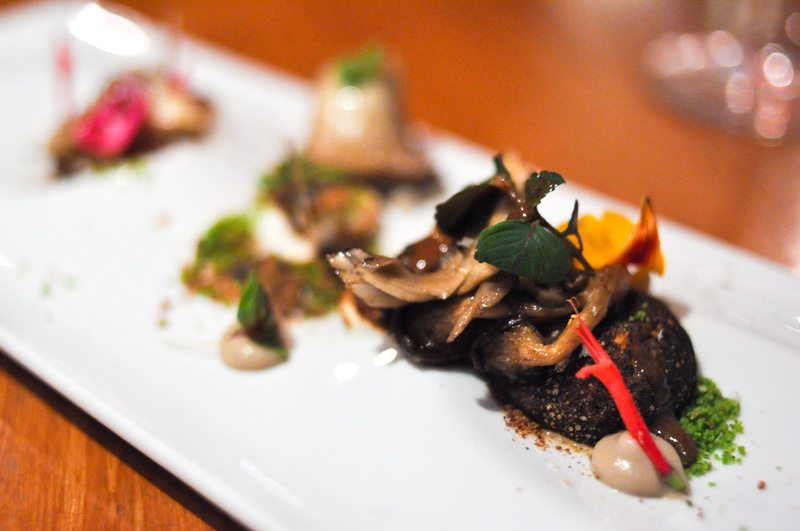 Beautiful layers of savory salinity going on amidst the seeds and grains. A subtle smokiness has arrived, and a new start. 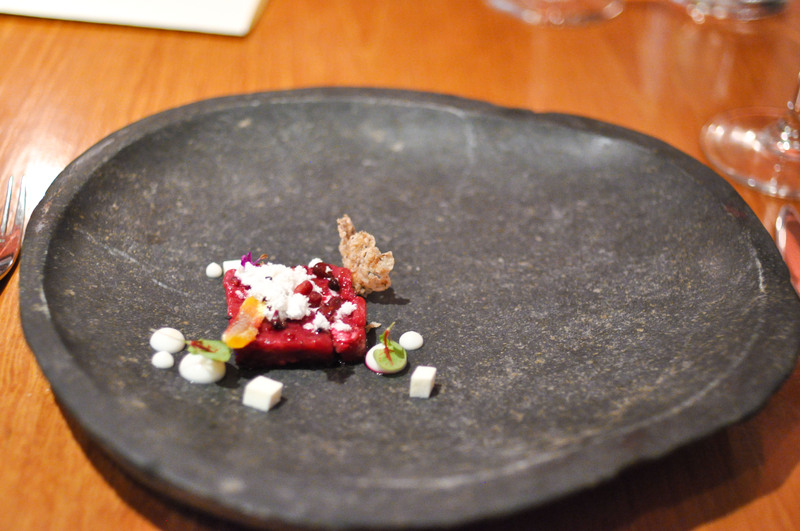 Lamb tartare marinated with beet and shallot and infused with smoked eel, sesame powder, rice tulle, blackberry, creme fraiche cubes, horseradish pudding, cured eel. 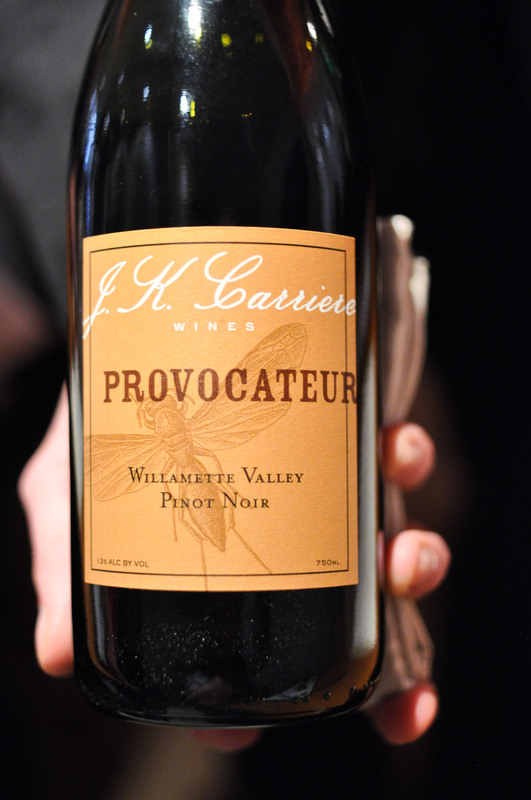 Many pieces and flavors that all came together to make perfect sense. Fallen leaf of crispy autumn scene. 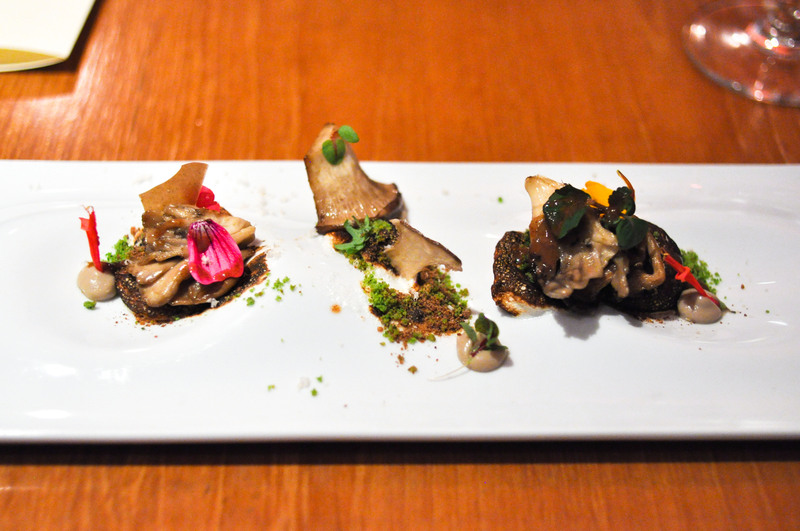 Mushrooms: king trumpet, maitake, and pioppini: roasted, pickled, pureed, and dehydrated. With hazelnuts, shaved and in a praline, thai basil, pumpernickel chiffon, sorrel, and foraged flowers, all set off by an insane brûléed pine meringue. Three months later, I’m still trying to wrap my head around this one. Birth which gives its morning mystery. 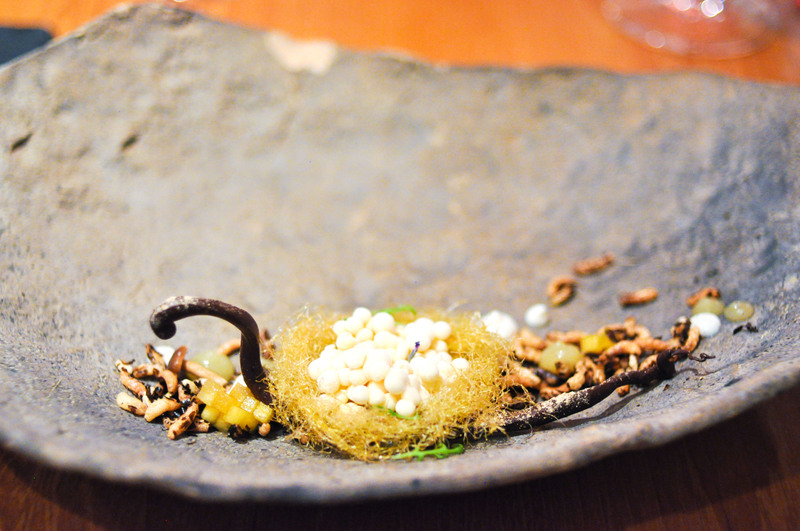 Corn silk nest, corn and duck fat pearls, chocolate branch with porcini powder, vanilla and apple sauces, served with warm duck consommé. 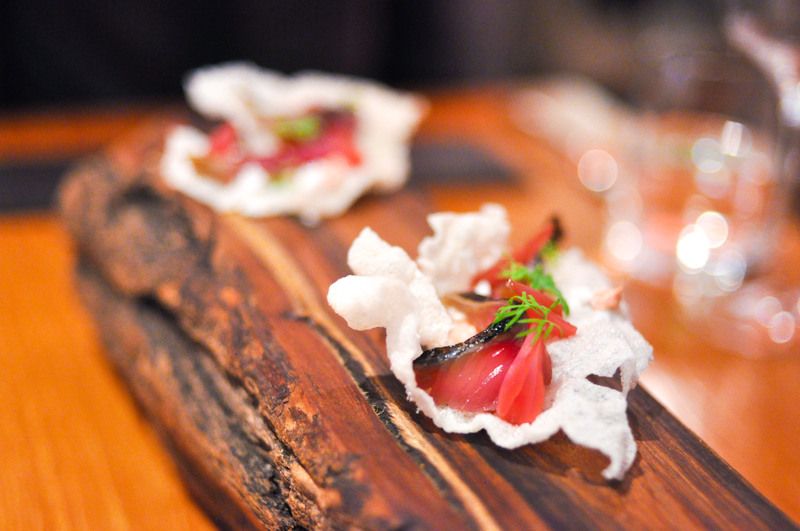 At the first couple bites, The Bro and I both thought this might be a dessert, though a sip of the consommé brings it all full circle and suddenly the sweet flavors sensically melt into savory harmony. And birds fly free. 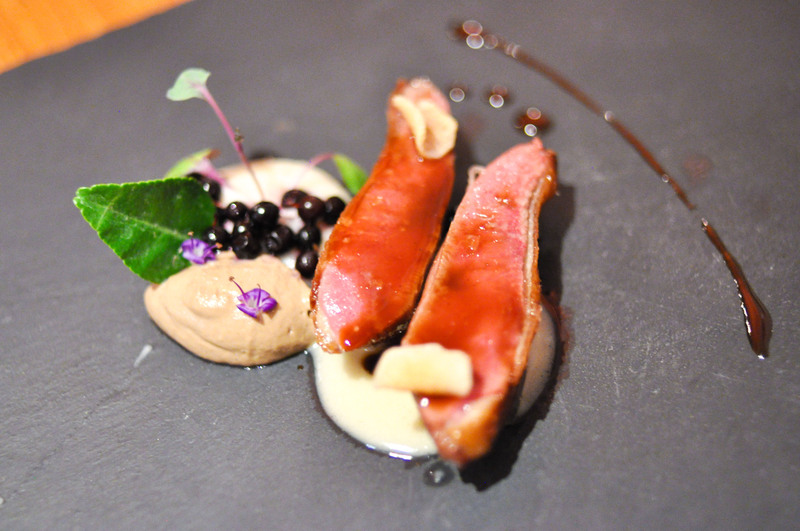 Sonoma squab cooked sous-vide and seared, liver mousse, fumet beurre blanc, sunchoke chips and puree, huckleberry, squab-madeira-truffle jus, kaffir lime leaf. 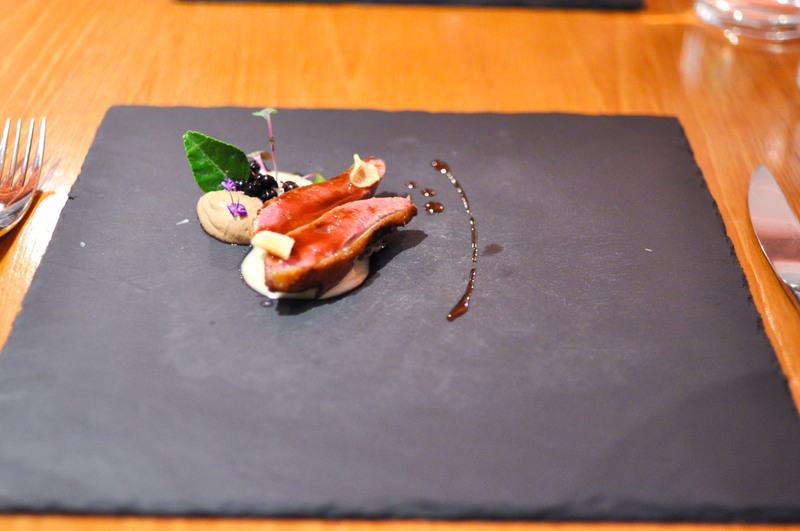 A well-executed, well-balanced slate of bird. The kaffir leaf seemed to reset the richness with a lasting bitter/fresh quality. 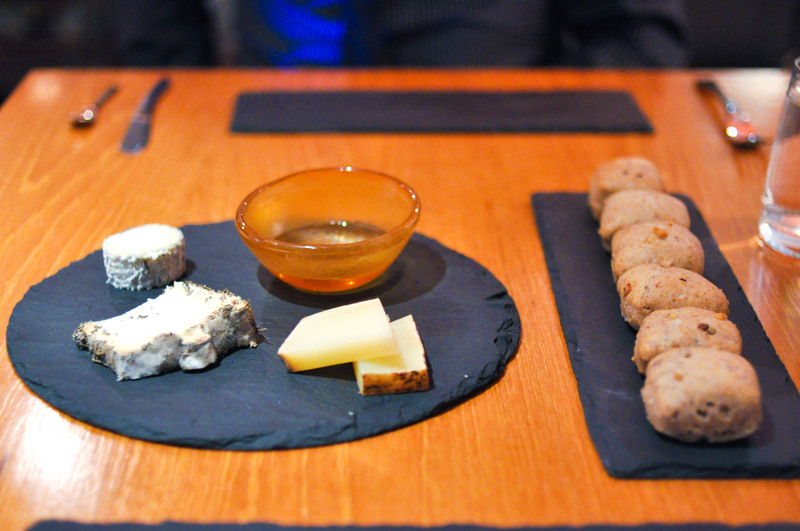 The option was presented for a supplemental cheese course. We of course were happy to oblige. Being that at this point I hadn’t yet been to bed from the night before and had received a steady stream of alcohol, I was starting to get a little fuzzy. Sadly, I don’t remember any specifics. Photo looks yummy though. Autumn is here. Fall spiced brioche, celery ice cream, pumpkin seed, apple, hibiscus. 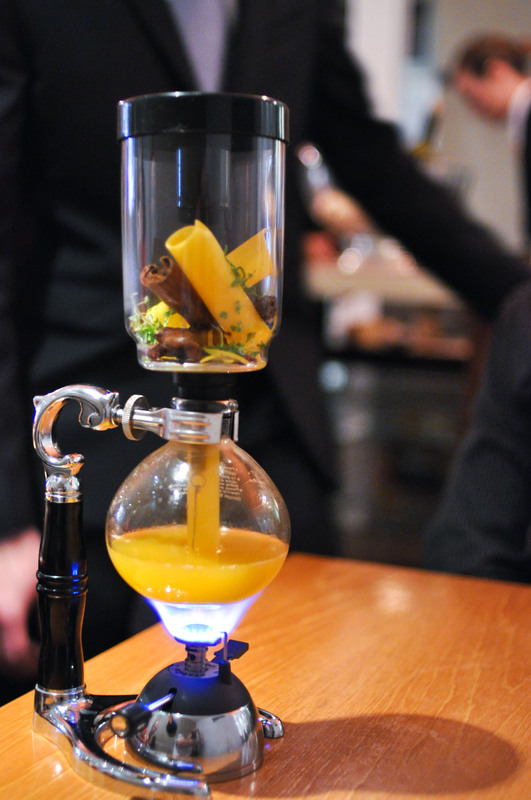 With an infusion of orange, butternut squash, anise, allspice clove, cinnamon, vanilla. 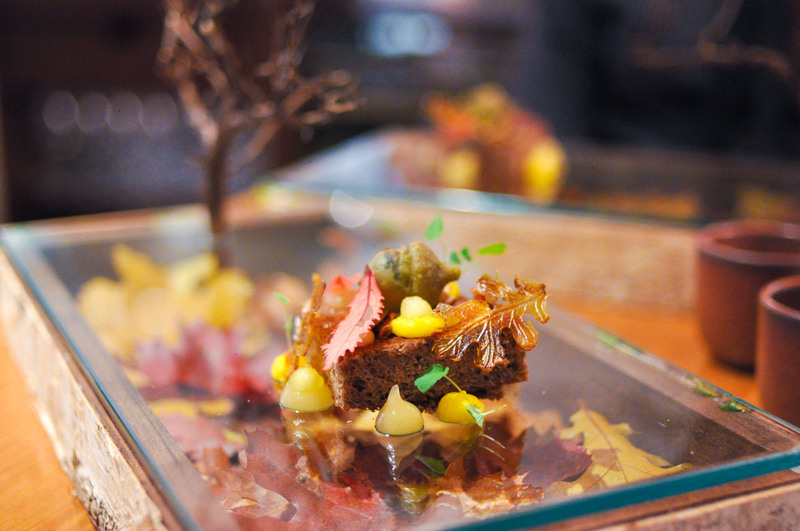 The faux acorn was caramelized sugar with apple puree and nocino. 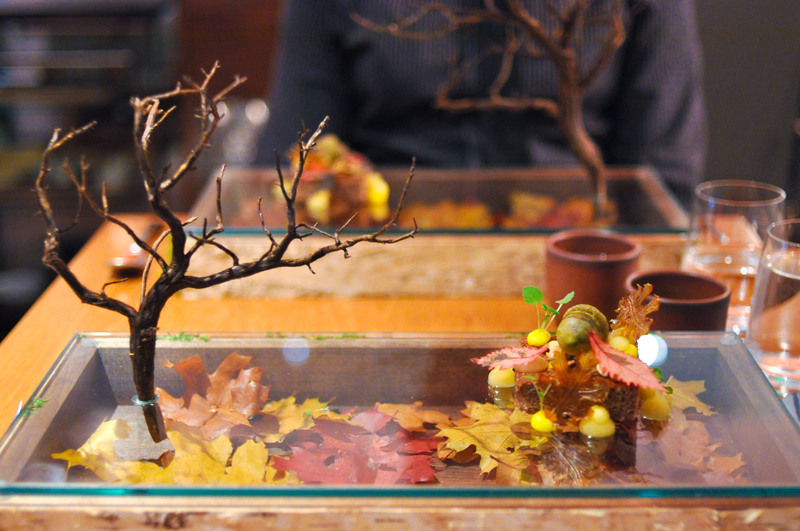 Quite the full-sensory celebration of autumn in dessert form. 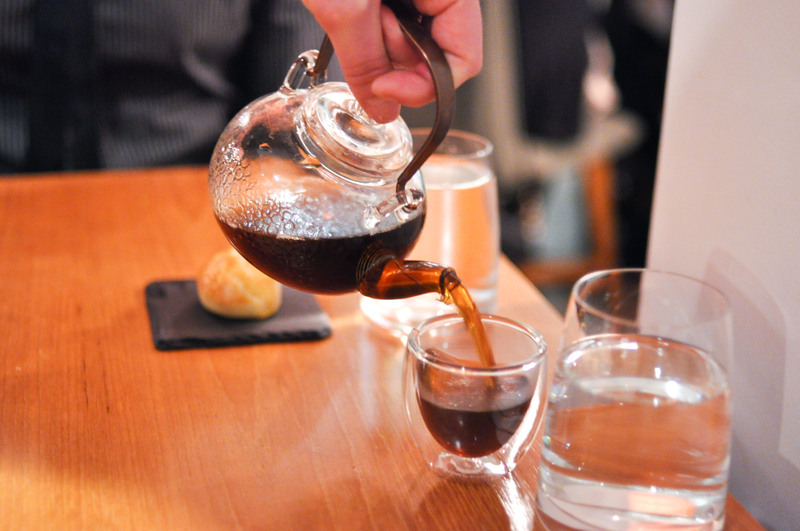 Beautifully balanced warm flavors and aromas from Pastry Chef Juan Contreras. 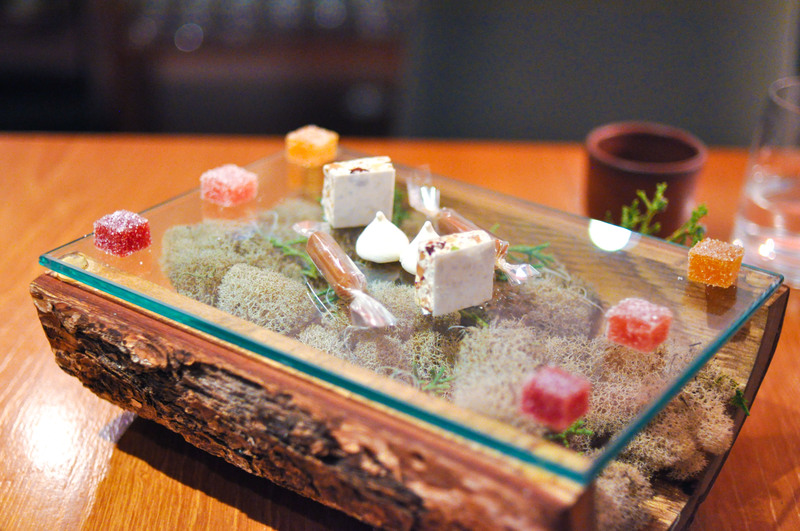 Pate de fruits: Mango celery, guava coriander, strawberry peppermint. Marshmallows: pictachio almond cherry with rice paper nougat, passion fruit. Maldon salt caramel. 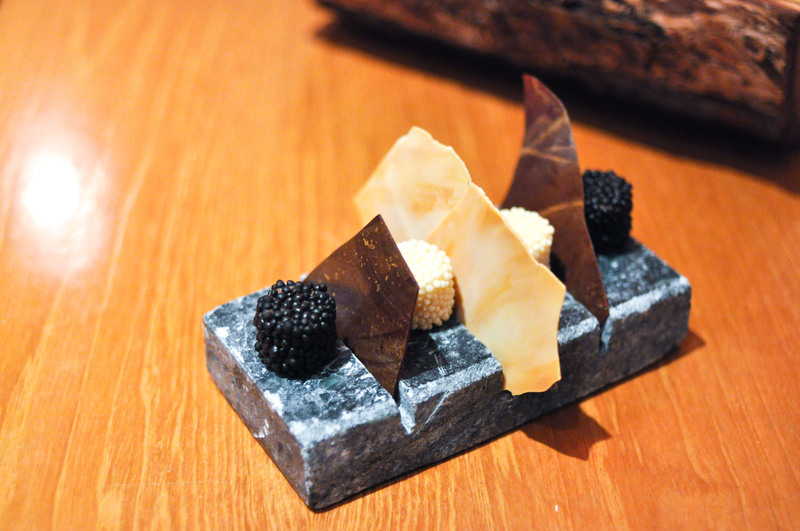 Chocolate: white chocolate with cardamom, caramelized white chocolate, espresso-chocolate ganache, Valrhona dark. 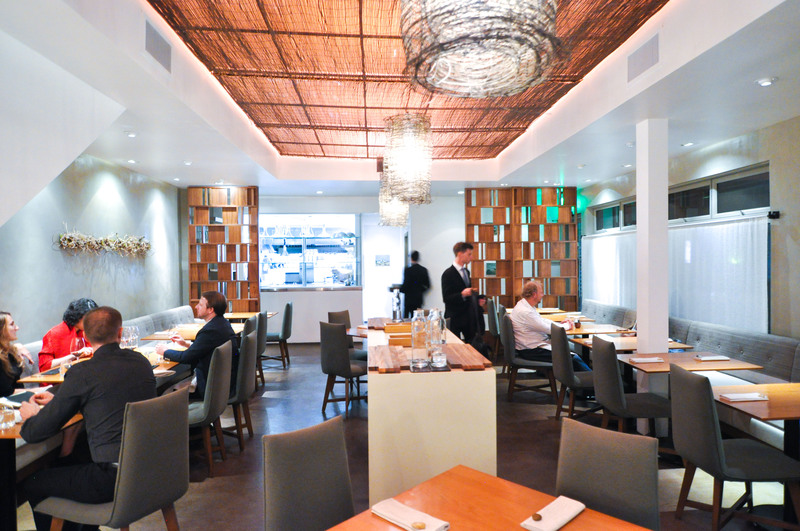 More than an amazing meal at the hands of Chef Dominique and her team; the experience was cerebral, sensual, and intimate. I look forward to returning with Rocky for this year’s trip out west.